This page covers some of the most commonly asked questions about the online Washington boater safety course. BOATERexam.com® is an online boater’s safety course that is approved by the Washington State Parks and Recreation Commission. By successfully completing the BOATERexam.com® Washington state boater safety course, you will obtain your Washington State boaters license. 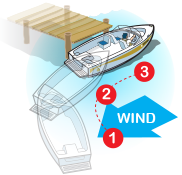 If you were born on or after January 1st, 1955 and you operate a powered watercraft with an engine greater than 15 horsepower (including personal watercraft), State boating laws require you to carry a Washington Boater Education Card. Q. What is included in the online course? The BOATERexam.com® Washington State boater safety course is made up of seven chapters covering key Washington boater safety topics, including required safety equipment, navigation and state boating rules, and what to do in the case of a boating emergency. Every page in the course includes illustrations and animations, and all text is narrated. After completing the course, you can print out a temporary State Boater Education Card while you wait to receive your permanent card. Q. How much does BOATERexam.com® cost? The online Washington State boater safety course costs $29.95. There is an additional $10 state fee for processing your card. You pay for your course only when you pass, so there is no risk or cost to signing up and studying the course. At the end of every chapter, there is a 10-question multiple-choice quiz to review what you have learned. You must pass with a score of 80% or better to move on to the next chapter. At the end of the course, there is a 75 question multiple-choice final exam. You must receive a score of 80% or better to receive your Boater Education Card. Got it? Get started now! There is no time limit to complete the final exam. While the exam is not timed, inactive exams will be erased after 24 hours. Q. Can I review my final exam answers? Yes. After completing the final exam, answers are graded immediately and available for review, whether you passed or failed the final exam. Q. What if I don’t pass a chapter quiz or the final exam? If you fail a chapter quiz, you can simply re-study the chapter and take the quiz again. If you fail the final exam, you can retake the exam as many times as you need to pass. There is no waiting time or cost to retake the exam. To ensure that all Washington boater safety topics are properly covered, the Washington State Parks and Recreation Commission requires every approved online boater safety course to include a minimum of three hours of study time. BOATERexam.com® will take about three hours to complete, or a little more, depending on how fast you like to study. Note: You do not have to complete the Washington State boater safety course in one sitting. You can start and stop the course as many times as you like and your progress will be saved as you go. Q. I am taking the online course. Why can't I click "Next" on a page? The time you spend on each page is tracked to make sure that a minimum of three hours is spent studying the material, which is a Washington State Parks requirement. If the "Next" button is not active, it means that you have not spent the minimum required time on the page. Q. When will I receive my Washington Boater Education Card? 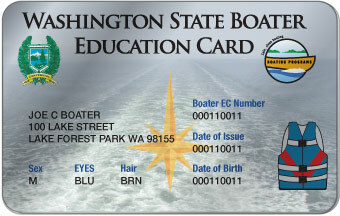 You can print out a temporary Boater Education Card as soon as you pass your online course. Your official permanent Boater Education Card will arrive in the mail in 3-5 weeks. Q. How long is my temporary Boater Education Card good for? Your temporary Washington Boater Education Card is good for 60 days, within which time your permanent card should arrive in the mail.